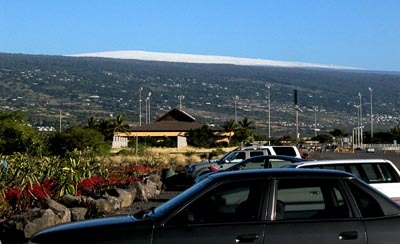 A view of Mauna Loa summit from the Maka`eo walking path at Old Kona Airport Park. Good snowfall on Mauna Kea and Mauna Loa, not sure if it snowed on Hualalai and if it did it probably melted before we could see it. You’re looking over the flank of Mt. Hualalai with Mauna Loa behind it, very clear day and it will no doubt start melting the snow.